More Meijer Deals, week of 8/30! I have highlighted some must do deal's below! Some are in the ad and some are not! Which one's are you excited for? 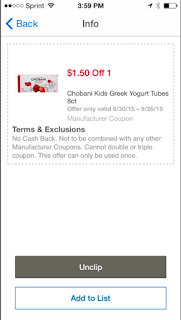 Chobani Tubes, 8ct are on a price drop again this week for $2.50! Great for school lunches, or snacks! Final Cost: $0.50 for the box! UPDATE: Angela Denny had this high value coupon, making them FREE for her!! Check your account's too for this freebie! On sale this week, from $6.99 down to $2.99!!! Plus there is a $2 coupon! The box says there are/is $4 coupon inside. Final Price: $0.99 for the first one! I do not know what the $4 coupons are for, but if they are for the same kit, then the kit's you buy next will be FREE, just keep rolling the coupon! There is also a $0.75/2 printable Duncan Hines cake mix coupon! Use (1) $0.75/2 printable Duncan Hines cake mix coupon! Final Price: $0.99 after coupon! Final Price: $1.49 after coupon! Final Price: As low as $0.39 each wyb 2 and use the $1 coupon above! Minute Rice products are on sale for $1.79, the Multi-Grain is included in this sale! The Maybelline Volume Express Mascara is on Price Drop for $5 and it is part of the buy 3, save $3 instantly!!! Other Maybelline mascara's are priced at $6.29, if you want to mix and match! Buy (3) Maybelline Volume Express Mascara - $5 each - Get $3 off instantly! Final Price: $1.66 each wyb 3! Yogurt covered raisins are on price drop for $2.50 a bag! Great for kid's lunch boxes! I used to use Persil back in England! It is the Tide of Europe! !